You will get a warm welcome from your guide and be transferred to the hotel. Yellow Stone Village: After breakfast in the hotel ,visit Yellow Stone Village, It lies to the west of Zhangjiajie Forest Park with an altitude of 1200m and covers an area of 250mu. You can enjoy the Six Stranges Pagoda, Picking Star Platform, Five Finger Peak, Lover peaks and so on when you are on the top of mountain. Golden Whip Stream: Located in Zhangjiajie National Forest Park, it covers a distance of 7.5 km from north to south, winding across mountains and valleys. The brook is limpid through the year, with many scenic spots along the way. It is famous for Jinbian Cave-which has a height of 382km and looks like a huge flying eagle. Wear good walking shoes and protection from the weather. 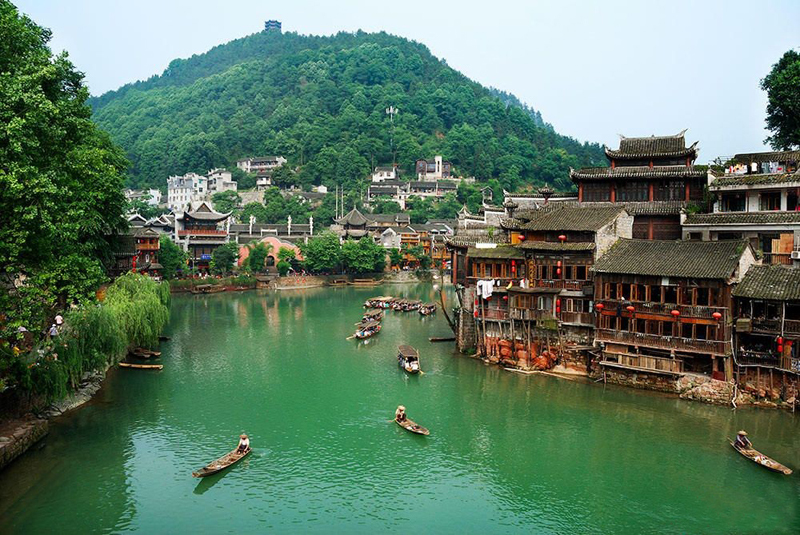 Option: The charming of Western Hunan Show. 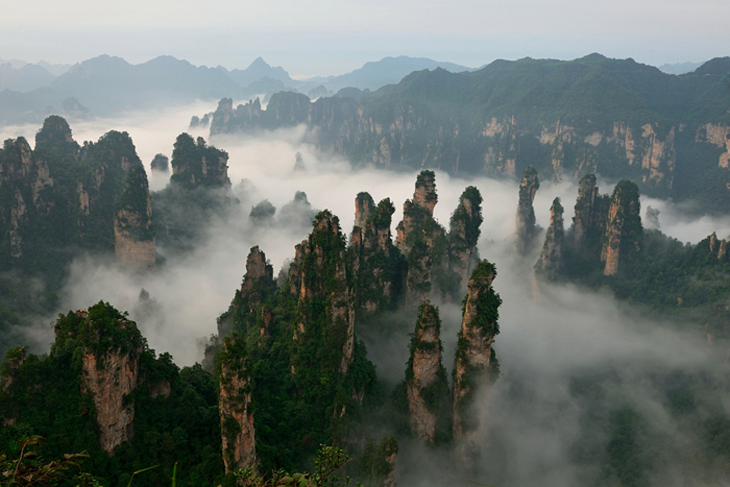 Yuanjiajie: This mountain is also called AVATAR Mountain for the movie AVATAR is shot here. 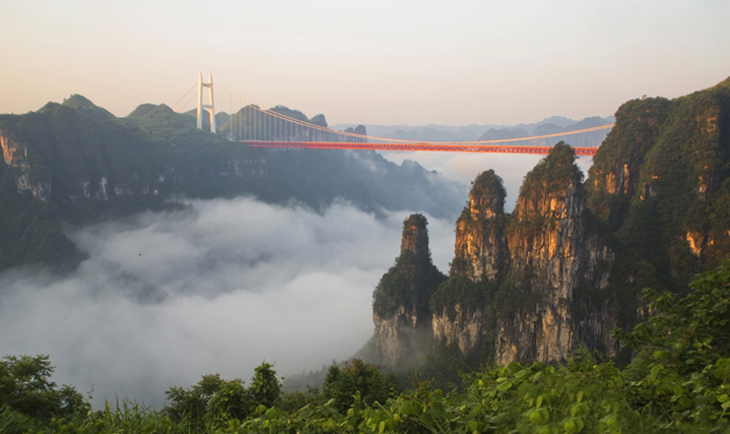 Enjoy Hallelujah Mountain, NO.1 Bridge in the world and so on. Tujia Folk Garden: With woodcarving on the windows, Flying Eaves and colorful wall, Tujia Folk Garden is a masterpiece of nature and manmade. 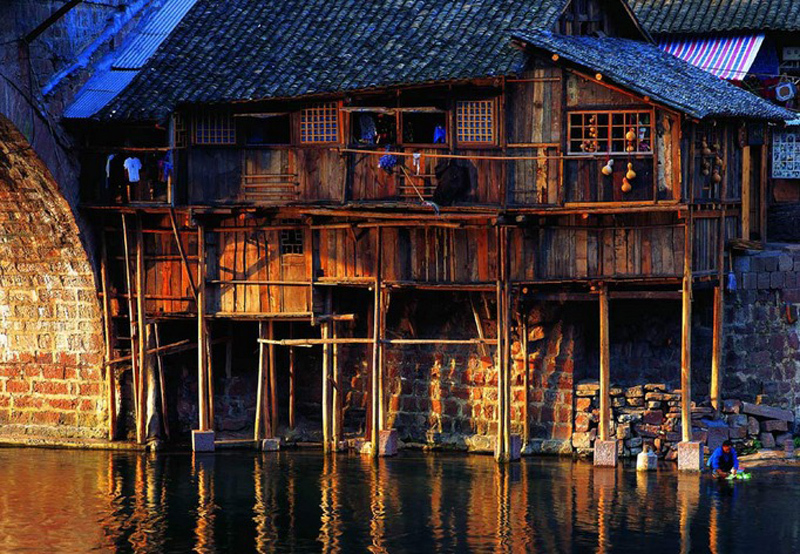 In the park,the famous buildings are Tusi Town, Baoshou or Wave Hand Hall and Tujia Village. Chongtian Tower, which is 48 meters high, has 12 stories with special design. 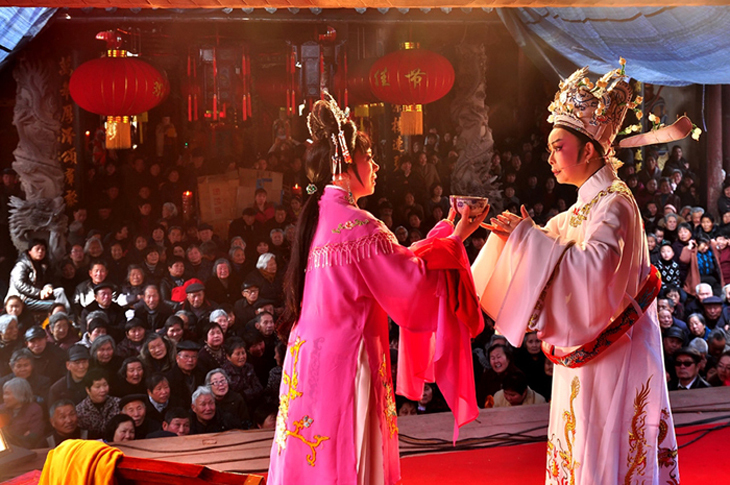 The park shows Tujia customs, special stone, root carving, precious relics and old Tujia folk performance, such as Maogusi Dance and Copper Bells Dance. Dehang Miao Village: It takes 3 hours from Zhangjiajie to Hangwu Miao Village, located in the west suburbs from Jishou city, Dehang means a "beautiful valley" in Miao language,In the scenic spot, streams are crossing to each other; deep valleys, spectacular waterfalls, grand mountain ranges, ancient trees and special flowers, precious birds and animals are everywhere.you will have a better understanding to the Miao nationally after visiting this village.what's more, you will pass the Aizhai Bridge on the way to the Miao village, Aizhai Bridge is praised to be one of the greatest engineering wonders,with length of 1073.65m,the bridge just likes a flying dragon in the sky. 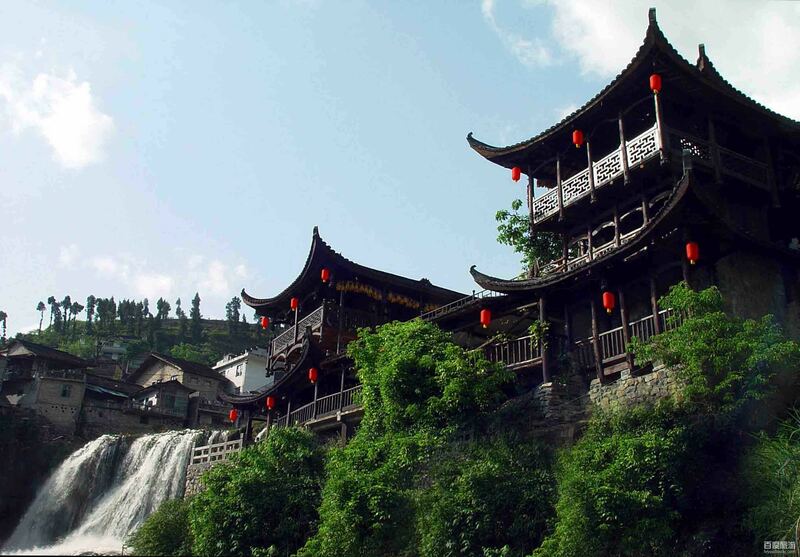 After breakfast, visit Furong town, this town ,named because of a famous movie, is located between Zhangjiajie and Phoenix ancient city, 2.5hour bus riding from Phoenix ancient city to this town, the most beautiful spot is the spectacular waterfall in the town. Lijunshen Sandstone painting Museum: Li Junsheng's sandstone paintings break through the using of traditional painting materials and use nature materials by making use of the hue of natural plant creatively, are of great art and collection values. He said, "An exquisite work of art is free from the shackles of materials and techniques, but depends on the artist’s inspiration. Seeing you off in Zhangjiajie airport, looking forward to seeing you next time.